“Persons who spent whole days in prayer and sacrifice to ensure that their children should outlive them were termed ‘superstitious’ (from superstes, a survivor), and the word later acquired a wider application. Those on the other hand who carefully reviewed and so to speak retraced all the lore of ritual were called ‘religious’ from relegere (to retrace or re‑read), like ‘elegant’ from eligere (to select), ‘diligent’ from diligere (to care for), ‘intelligent’ from intellegere (to understand); for all these words contain the same sense of ‘picking out’ (legere) that is present in ‘religious.’” – Cicero, De Natura Deorum II.72. On the surface, despite many numerous differences, definitions of religion are predicated on – or otherwise revolve around – the concept of an identified object of extra-human and “supernatural” quality. Something which necessarily sets itself apart from nature or is otherwise added to the natural world. Of course, as a trained anthropologist, as well as a historian who has dealt with religious history quite frequently, religion as a definition genuinely transcends the notion of a mere supernatural qualifier. Pascal Boyer’s quote, above, is largely comparable to my own internalization and use of the definition of the phenomenon of “human religion”. This year – 2017 – marks the twentieth year as identifying as a Pagan in the contemporary religious sense. While I’m not hardly in the running for that being any length of time, I am particularly seasoned. And as that anniversary draws closer I will do my best to commemorate it. But, to me, it has always been the pull to the “supernatural”, to the imminency of this religious quality, that gets ascribed to the definition of religion by academics. I do not feel that the term “supernatural” is wholly appropriate as a description of the quality of the divine, as I view it as pervasive within the natural world. The description of the gods, the spirits, and other holy powers is diminished through the use of this word, implying that they exist beyond nature – a transcendent quality which informs the greater understanding of “religion”. It, in some way, simply does not apply. I am an empiricist. I have training in two social sciences and rely on qualitative observations and the collection of identified facts in order to orient my deductions and assumptions. Two of the primary philosophical schools which I ascribe, and which inform my worldview, are Empiricism and Scepticism as they’re understood in the humanistic understanding of the Renaissance, prior to the period of the Enlightenment. I trust in the scientific method. I am excited by new discoveries that rewrite our understanding of our place in the cosmos, of evolution, and of the geologic timescale. As a result of this very logical framework to my training and my approach to life I do not particularly favor coincidence, repetition, and other probable qualities as indication of some greater-than-human force within the world. And yet, I am an ardent polytheist and animist. This is because of my experiences in this world, many of which do not have a logical answer. I suffer from a very mild form of depression, which is being treated. Who from the millennial generation doesn’t? That is the extent of any “aberration” to my mental health. I do not have a history of greater mental health problems in my family. I do not “crack” under stress. I am considered healthy and active. Other than a bout of unemployment, I’m productive. I’ve never done drugs, other than drinking a ton of coffee and socially drinking alcohol. I’m generally pretty boring. Why is this laundry list important? Because they are generally the first qualities which skeptics and atheists look for in the overtly religious, in order to denigrate our intelligence or our actions. That there’s something wrong with us. That our intelligence is up to question. Or we’re inherently inferior. I find that polytheism receives the brunt of this, because we don’t believe in just one “imaginary friend”, but many. But, because of this, I am forced to accept that there is more to the world than what I know and conceivably articulate or explain. To me, and to my experience, that translates to a multiplicity and plurality of divinity, and an intersection with a world of spirits that I share the space with. I never “lost” the worldview of my youth, was fortunate that it was never stamped out by over-zealous parents. I was raised in a fairly a-religious household, with a mother and grandmother who were interested in other religions. So being a polytheistic Pagan is very much just a natural progression of my life. But what I learned early on was that being a polytheist – and by that I mean one who doesn’t reduce down the deities into a mere two (or less) beings, or view them as facets and manifestations of the human condition – was very atypical. I came to Paganism during the heyday of the Llewellyn craze, after the SRA panic settled and Wicca and Paganism were commodified. After The Craft. One year before Charmed. Paganism, Wicca, and “the supernatural” were suddenly trendy. Marketable. Polytheism, however, was not. At least, not in the same way. Our gods were “petty and cruel”, according to the lead-in of Hercules: The Legendary Journeys. They were really aliens, either little grey men or parasitical worm that enslaved worlds, as in Stargate. Fast forward into the Aughts, and Supernatural, and Loki was really Gabriel and the Gods were all demons. Or whatever, that show is trash. While Wicca and Paganism were being rehabilitated (regardless of their accuracy), polytheism languished as a cheap television trope. Something either blatantly wrong, or the hallmark of primitivism. (We’ll see if American Gods changes that, but I’m hardly expecting it to). And, it seemed, that these common themes were repeated in the wider Pagan community in attitudes and reception. I ventured into the world of online Paganism shortly after I embraced it and what I found was reductionism and reactionary baggage and toxic “free spirited” counterculture. The Gods are all facets of One God, the Goddesses are all facets of One Goddess. There were no gods, but a universal divinity towards Nature. Worship was what Christians did. The Gods are myths and stories and do not exist. Spells, spells, spells. These thoughts, and others, were the common zeitgeist of the collective discussion Paganism. Discussion was on spells and self-realization and either ego/self-centric or nature-centric practice. If you believed in [Divinity] you were a Wiccan or a Druid, but always in a reductionist way. Deity reduced to a Duality or Nature. Or nothing at all. If you believed in multiple and independent deities, well, you were wrong. You were corrected. The gods were all facets of one universal source, not independent entities. The same people who said that belief didn’t matter, and that Paganism was focused on action, were the first to cast aspersions were you to go beyond the pale of indoctrinated theology and believe – truly believe – in multiple gods. And it’s funny because in my twenty years, that really hasn’t changed. It’s more accepted now, but polytheism in a Western context is still looked at as aberrant. It is still openly derided and mocked by those who would claim a part of the community, and expect respect and toleration for their blatantly intolerant views. It’s been beaten into the Western mind that the Gods are fables, myths, stories, demons, or sheer delusions. They’re tropes, archetypes, figments of personality, or mental projections. The great writers of the past who earnestly believed in these beings, who took part in their cults, and who lived these lives, are looked at as relics with little religious value. The words of Marcus Aurelius in Meditations are viewed as an example of “someone who really didn’t believe” in a polytheistic divinity (Secret: He did), and the modern Stoic Revival distances itself from the religious implications of his words. In exchange, modern Pagan and Wiccan writers that look at the gods as metaphors are excused, accepted, and lauded. Can we really argue against an anti-polytheist indoctrination within Contemporary Paganism, even if it is unintentional? I’m not even sure that it truly can be that unintentional. Contemporary Paganism is full of people with agendas, like any other human institution. And it’s not a new feature. Margot Adler had a very specific view of what she felt should be promoted in the Paganism she wrote about in Drawing Down the Moon. She was not above reporting false information (Claimed Ray Buckland’s Seax-Wica/Saxon Witchcraft tradition was founded as a “joke” and refused to recant). It is as full with petty drama as any other community, both in the online and in the offline spheres. Witch wars were, and still are, a thing – often driven by ego. And that’s not even getting into the politics. Woo, boy. Is the growth of polytheism within Contemporary Paganism an effort to enforce an orthodoxy, a correct belief in the multiplicity of the divine? The sinister attempts of a cabal to enforce a rigidity designed to trample expression and belief? Of a rising fundamentalism of religion? There are many who would portray it that way and who believe it to be that way. Or is it due to forces that have only really taken hold since the early 2000s? The growth of online communities connecting people in far-flung areas, to discuss their ideas of worth, value, religion, and belief? And the realization that there are many more than the dominant culture would otherwise have expected? A burst of new interests, new changes, new developments, and a maturing community? The pressure against polytheism within the Contemporary Pagan community bears the hallmarks of a majority population feeling threatened by a vocal minority who are agitating for representation within the demographic. Accusations that any one space are overrun with the perspective and paradigm, false portrayals and misrepresentative accounts of the group in order to discredit the whole. Accounts are diminished in ways that would rile people up if it was done to the indigenous folk religions of other peoples. Since 2012-2013, we’ve largely seen some of that representation. The Wild Hunt now refers to “the polytheism community” (itself a problematic term, but that’s another story). Initiatives like Polytheist.Com were launched, although apparently now deceased. Devotional and theological anthologies treating the deities with due reverence, honor, and respect are published frequently, taking advantage of more affordable small-scale publishing and print on demand services (although Neos Alexandria as an organization predates this by several years). There were talks of the establishment of polytheistic Pagan conventions. We first had the Polytheist Leadership Conference, from which spun out Many Gods West. The theological beauty of polytheism is that it is inherently pluralistic. It can coexist with a variety of other theological perspectives because it is a non-exclusivist position. It makes only one universal claim: that the gods exist and those gods number more than two. The iterations of them are up to the individual religion and context. It clashes with the assertion of a transcendent deity. It has problems when people tell us that there are no deities and that we are backwards people believing in a fiction. It denies our agency and the claims of our legitimacy of practice, and represents an all-too-ethnocentric viewpoint. The expectation that we are broken, or that we should meekly kowtow to the popular will of an overly reductionistic society, rankles. The implication that we are only “new” since the turn of the millennium is simply incorrect. The belief in immanent spirits and deities is an “anthropological universal”, and is one of those features that is widely regarded as consistent across all human cultures. It has been since the beginning of humanity, and is thought to be represented in our closest hominid relatives. Our belief is not “new”, even if our contemporary practice is. If polytheism has one universal quality that it asserts, it is that the gods and spirits exist. They simply are. They don’t need to have their detractors believe in them. Their worshipers need to not have people try to silence them. I think that part of the problem is how people see the Other. That which is outside of themselves. I learned many years ago from a good friend and astronomer who studied UFOs that people define things in terms of themselves. UFO contactee stories have been explained as a person tapping into the unconscious and revealing an archetype. That is one of the logical and reasonable explanations for this weird whatever. But what if for some, the experience was with an actual ET… that is too much too take in for many people. I liken the current propensity of Pagans in general and certain ones in particular of explaining Gods in turns of human experience to be the same. It is easier to believe in an archetype or the great unconscious, than to experience fully the terrifying Other. I believe that the attempted erasure of Polytheists by some bloggers to be rooted in this – awe and fear of the Other. It is an issue of control of the universe and a safety of belief. However, I have also noticed that for some who think the Gods are One or archetypes, that when they are in trouble, they pray to them. How does an archetype respond to a human need? I leave it at that. As a polytheist I generally feel like an outsider amongst other pagans, particularly in Britain where there was a rush of interest in polytheism in the early 2000s that has now declined whereas it seems to be growing in popularity in the states. One of the things I’ve recently realised is that very few other pagans worship the gods and that worship is generally seen amongst pagans as a dirty word. Whilst some will acknowledge them at certain festivals or ‘work with’ them to attain a specific goal few worship and have a regular devotional practice. I’m with you as seeing the gods as immanent within nature. For me as a Brythonic polytheist even our Otherworld, Annwn, ‘the Deep’, is a deeper part of nature thus its gods are a deeper part of nature too. I’ve found that the Protestant countries are particularly tough to deal with in regards to polytheist vs. not. Heathens from Northern Europe are particularly notable for this, given the influence and intertwined nature of Lutheranism in their whole society. I’m glad it’s not just an “American thing”, although I wish it weren’t a thing at all. I wrote a post last year about the incidence of reactionary definitions in Paganism (especially in the USA), and I think the problems with terms like “worship” or “religion as involved with supernatural concepts” absolutely have connections to that practice. People’s actions and attitude towards these concepts should absolutely be faced. In sociology we actually covered religions such as Buddhism that are more based on the ethical, then the “supernatural”. Patriotism was considered a religion under these definitions. On your other note, back when Paganspace was in its’ hay day, me and others felt that “supernatural” was an oxy moron. [Same for paranormal.] I only used it as layman terms to describe spirits and the like. Nothing exists outside of natural, as you so adequately pointed out, so the term should be retired. It’s amazing to me then, that many atheists, do not take this position, and rather, chose to act as though they are superior to others for not believing in something deemed “primitive”. If your only (or one of them) position as an atheist is to feel superior to other homo sapiens you need to study more science and stop enacting the Dunning-Kruger effect. Just to say that TV is also getting steadily better in this regard. Adventure Time has many gods in it and polytheism is not looked down upon. It’s a part of their world. (Such as the Cosmic Owl and the Party God.) I also saw a kids show with a character simply called “Goddess”, IDK if there was more than one, but I thought this was a unique aspect. If you go outside of American media, many things show case polytheism more: Persona 1-4, Silent Hill series (which takes place in America. ), and InuYasha to name a few. I haven’t found much backlash in the community, as a polytheist, since I entered in 2006ish. But I was around a lot of recons at first, and then other Neopagans. Most were accepting of it or did not care. I think a good amount of the ones I know are polytheists. I am not bothered by people saying it’s all in the mind or from the mind, gods are archetypes, and so forth. It’s psychological and I think that perfectly mixes with the spiritual. As someone who has been Pagan for around the same amount of time (coming up on 18 years), I definitely see where you are coming from. It has only been within the last couple of years that I have felt comfortable coming into Pagan society within the real world and not just on the internet. My practice was (and still is) largely solitary (though I do participate in community rituals now). I lurked on forums, read blog posts, did my own studying… and learned about the gods from the gods themselves. It is slowly getting better. Because we have polytheists now who are willing to speak up and provide a voice for those who are afraid of the backlash. I learned to ignore the criticism and offer a counter-perspective for those who were facing the same difficulties I did when coming to Paganism. 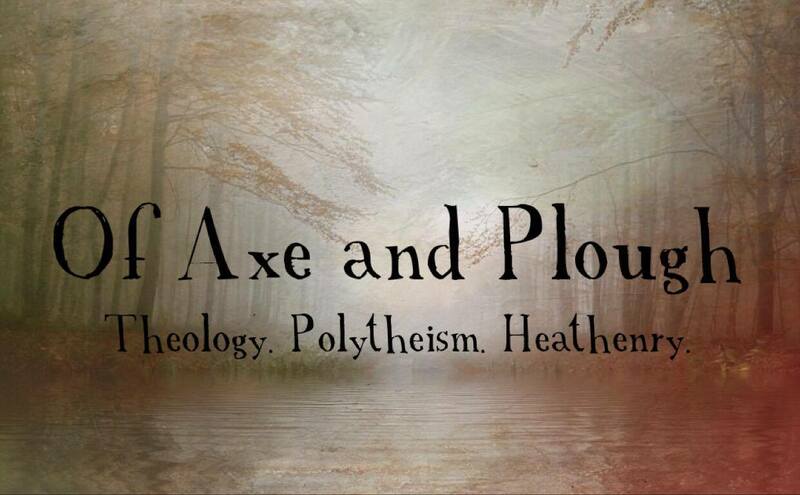 I still find myself referring to myself first as a polytheist, second as Pagan, as our voices have been silenced. We have been pushed aside and told we are crazy – sometimes by other polytheists, especially the ones that adhere to the many-faceted diamond interpretation of deity. Because we still live in a largely monotheistic world, where there is always going to be a “right” way (good) and “wrong” (bad) way to do everything. That framework still underpins a large part of the Pagan community, and it is that framework that can make it an incredibly uncomfortable experience for a polytheist to be around Pagans who don’t view the world as if deities are separate and distinct sovereign beings. It is getting better… but it is still bad. Anyone who hasn’t experienced the toxicity non-polytheist Pagans can exert towards polytheists should count themselves lucky – and start making time. Because we’re not fighting a simple misunderstanding – we’re fighting against an embedded mental framework, courtesy of the monotheistic society we live within.